I am beginning to think this Haunted House Scratcher is really haunted! There are all sorts of things going on here that I can’t explain. What was that noise?! AHHHHHHHHH! Oh, it was just Binga. Never mind. Well, she does spend an awful lot of time haunting me, right? Oh, and also today is “Tocktober.” I’m not sure how it got started because I wasn’t even born yet, but an old blogging friend of Sparkle’s named Derby started a tradition on his birthday for other blogging kitties to show their rear ends. So here is mine. And here is some other kitty’s. Just so you know, I was still in the house when this photo was taken. mol! thanks for the smile, Summer. your haunted house is pretty cool! Oh my cat! Summer, your tocks are one of the best we’ve seen! 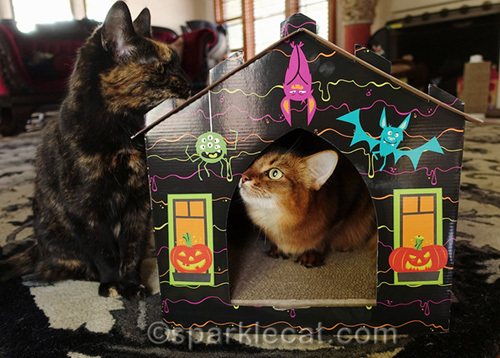 And it looks like you and Binga are having a fun haunting-and-taunting-each-other session! Oh you DID make us laugh!! Happy haunted tocktober!! Ooh, that’s a haunting thought about you and Binga being in that house together! MOL! Your tocks are so spectacular and floofy, you reallly don’t need a modesty patch. 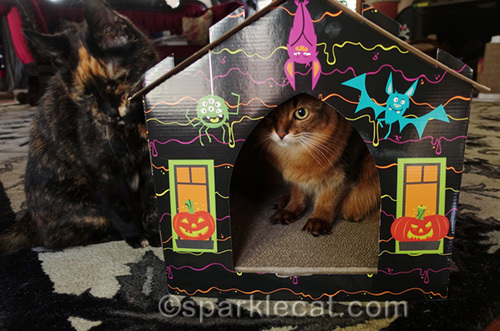 Purrfect way of showing your tocks along with your Halloween House! MOL! Those are some cute tocks shots. Y’know…our haunted house is really haunted too. Was Binga here?? IF I, Marvelous had floofy pants like you ladies do, I would not have had to wear the leaf of modesty. Summer, those are some mighty fine tocks. Hope you made it out of the haunted house Summer. Must have been kind of crowded in there with Binga too. That is an awesome haunted house! You have lovely Tocks, Summer. I needed a laugh and this set of photos of you and Binga was just the thing. Your human did a wonderful job of taking great photos of both of you. 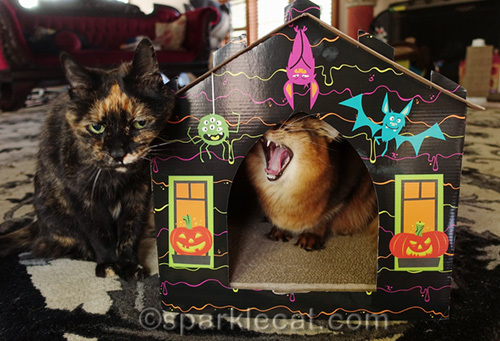 I’ll bet you were just thrilled when Binga REALLY haunted you by horning into the house with you. Oh Summer! 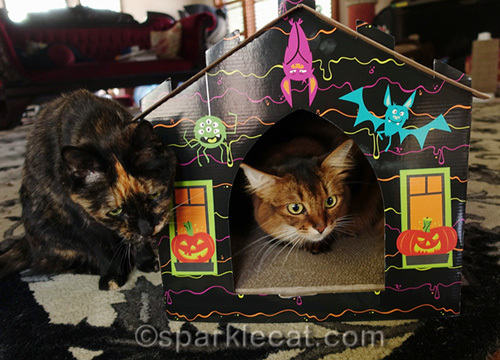 Your haunted house is so cute and I do believe you have solved the haunting issue – Binga-o-ween is your resident ghost! My Mom and Dad are back from their trip to Maine so we’re trying to catch up on blog stuff so bear with us as we do that……………looks like you have been your usual busy self though! I hope I get a Binga with my haunted house. 🙂 Just kidding, but we are very excited. You both have great tocks, I love your floofy tail. Oh you two got my mom laughing! LOVED the tocks, loved Bing’s face and that she headed on in without a by-your-leave! Spooky House! I love it! Summer, Binga just LURVs you so much! And that’s a wonderful pair of ‘tocks, but your floofy tail makes your photo just that much better. How much does Binga charge to haunt a house? MOL! Summer, your tocks photo is epic! Pretty Cats and Pretty Cats!! Summer, Binga and Boodie are Pretty Cats!! 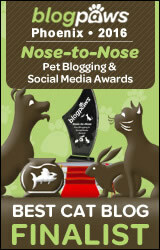 The photo of you screaming really made us MOL! Sigh… once again we missed Tock-Tober. We’ve never participated – isn’t that sad? There should be a giant sized cardboard cutout of Binga in every haunted house. Binga you my dear are super adorable. Haha! Binga got you! What a cool haunted house. You two are having a fun day! Good ‘Tocktober effort, Binga! But Summer, YOUR ‘Tocktober shot is the most amazing one we have seen yet! That awesome tail, plus those gorgeous black beauties to die for (ha ha)! Aww,I hope it’s not haunted. I’m pretty sure tortitude could be considered a scare tactic. Our human looked quick at the last picture and for a brief minute because (she hasn’t had enough coffee yet). She thought was our Blazie Marie-must be those tortie butts look alike. Happy Tocktober! Mol! Binga will take care of any ghosts. 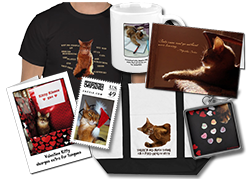 So, it’s Binga haunting your house 😉 MOL! You and Binga have lovely tocks for Tocktober !